Nestled between mountains on one side and the sea on the other, Oita Prefecture might be the most relaxing place in Japan. 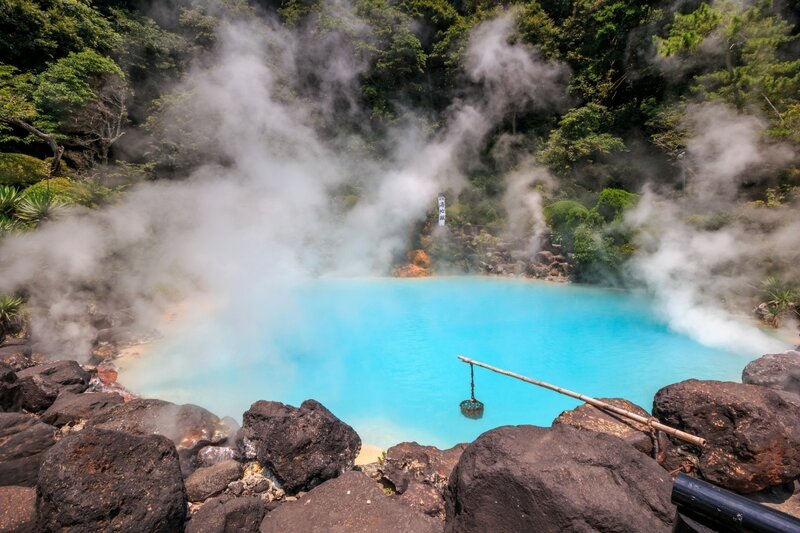 The city of Beppu is home to the world's second largest volume of natural hot spring water, and is widely regarded as one of the best places to enjoy a nice soak in its many onsen. But some springs are too hot to handle! Just one spring short of Dante's Inferno, scattered throughout Beppu are eight furiously hot baths which the public is prohibited from entering. Six of these so-called Hells are in the Kannawa area, and the other two are in Shibaseki. Each spring has a different theme, and there are buses that run circuits through each of the Hells (in either direction), which makes them very easy to explore. So let's go over what each one has to offer. First, there is the umi jigoku, or "Sea Hell," which has sky blue waters and a bunch of smaller pools around it. These smaller pools are orange, and have lotus leaves growing in them that are said to be strong enough to support a small child. The shiraike jigoku, or "White Hell," looks like a pot of boiling cream. Yama jigoku, or "Mountain Hell," has animals that are kept around it, like a miniature zoo. There's also oniyama jigoku the "Monster Mountain Hell," which features crocodiles. The cold-blooded reptiles enjoy soaking in the hot-springs and add an extra point of interest. Kamado jigoku, the "Cooking Pot Hell," is the cleanest of the pools. Visitors can eat food cooked in the spring, or even drink the water. The last of the six, the oniishibozu jigoku, is muddier than the others. The pool bubbles constantly, like heated custard, creating shapes that look like the shaved heads of monks (from which the spring derives its name!). Although the other two Hells are slightly removed from the previous six, they're still definitely worth visiting. Chinoike jigoku, or the "Blood Hell," is an impressive rust color that, when combined with the heat, actually gives the impression of its name. The final hell is tatsumaki jigoku, the "Tornado Hell," which actually features a geyser that erupts periodically throughout the day. When it does, a spout of water bursts into the air for up to 10 minutes, and even when it isn't erupting, the massive amount of steam surrounding it makes it seem like you’re standing in a cloud. Beyond their appeal as natural sightseeing hotspots (pardon the pun), these baths are also used in the creation of local goods and souvenirs, such as boiled eggs, or steamed vegetables and cakes. Onsen tamago—eggs boiled in the hot spring water—are a local specialty, and onsen-steamed pudding also make a good souvenir for those who visit. All year round you can see giant plumes of steam rising from the pools, and if you visit on a cold winter day it can look like a white whirlwind is sitting right in front of you. Although the Hells are too hot to enter, there are several foot baths surrounding them. They're free to enter, and the perfect place to take a relaxing load off while exploring. 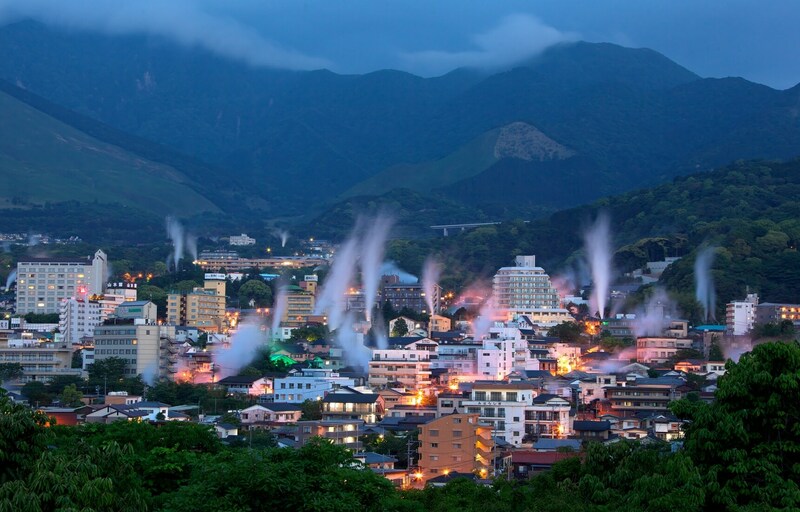 The Hells of Beppu are quite easy to reach, since there's such a prominent feature of the city, though they are some distance from the city center. A bus from Beppu Station takes about 15 minutes. If you disembark at Kannawa, you can see most of the Hells by foot. From there, you can walk or take the 16/16A bus to Shibaseki to see the rest. The reverse route is also possible, if that's your style. If you'd prefer to drive, parking at the Hells is free, but it costs ¥550 to visit one, or ¥2,100 (about US$19) to visit all eight. There are also bus tours for ¥3,600 (about US$33), which allows you to enjoy the beauty of the Hells from the comfort of a air conditioned bus. A seat on the tour can be booked at the Visitor Center in Beppu Station, but keep in mind that the commentary is only provided in Japanese. I'm a writer from the North East of England living in Yamaguchi. When I'm not bashing my head against the keyboard I'm making YouTube videos or teaching English.